Sri Durga Malleswara Swamy Varla Devasthanam has made elaborate arrangements for the Teppotsavam on the final day of Dasara on Wednesday. The temple priests adorn the goddess as Raja Rajeswari Devi on the final day before taking the deity for the evening ride in the river on swan boat. Durga temple authorities have set all arrangements for Teppotsavam. Temple authorities had already made a Hamsa vahanam which is special boat built in the shape of the mythical Hamsa. Temple priests taking the processional idol (Utsava vigraham) of Goddess Durga and Lord Mallikarjuna Swamy for nadi viharam (celestial boat ride) in the River Krishna on the occasion of Dasara. This time, temple officers set arrangements for the devotees to see the colourful Teppotisavam. The District Collector asked the officials to be cautious and advised them to take necessary precautions. Police and temple authorities wanted to take video with the help of drone. 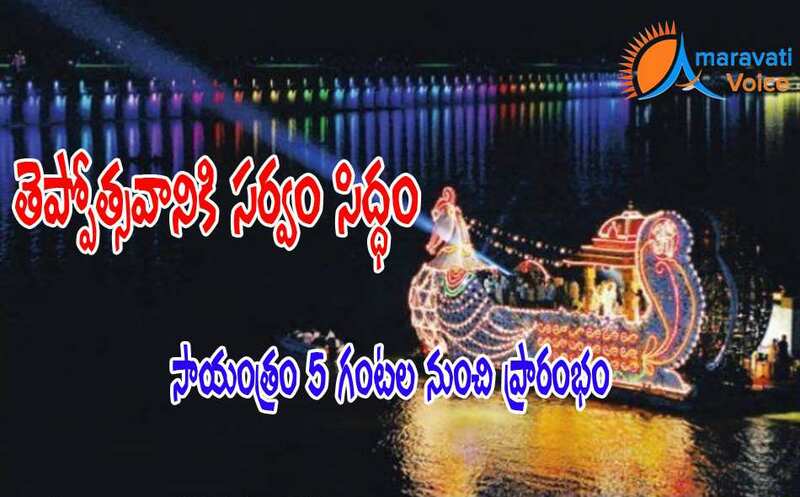 It is first time such type of video will be taken during Durga Devi Teppotsavam in the River Krishna. Police Commissioner Gautam Sawang directed his staff to take all steps to reduce the crowd and maintain Law and Order situation.